Superb design, software integration and build quality make this a resoundingly successful DJ mixer debut by NI. Stunning build quality Great features. Unrivalled software. USB hub. Control vinyl and CDs included. Great analogue/software integration. The last few years have seen a decisive move from CD- to laptop-based DJing and all the benefits that it brings. Native Instruments has been at the forefront of this wave, and with the Traktor Kontrol Z2, it's bringing us its first laptop DJ-tailored mixer. "The Z2 hardware functions as a Traktor-centric MIDI controller, audio interface, scratch decoder and conventional analogue DJ mixer"
The Z2 hardware functions as a Traktor-centric MIDI controller, audio interface, scratch decoder and conventional analogue DJ mixer. The included Traktor Pro software allows virtual DJing using a mouse, MIDI/QWERTY-mapped controls and control vinyl/CDs played via conventional decks. Like all good scratch mixers, the Z2 hardware keeps things simple. 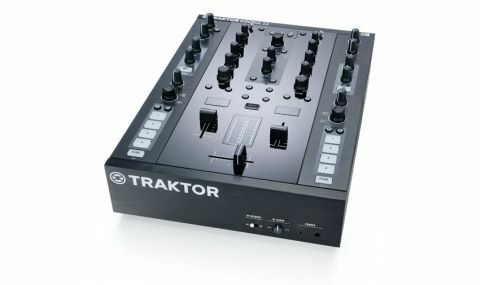 It offers two channels, fed by either line or phono inputs, both with built in Traktor Scratch decoders (Traktor Scratch Mk2 vinyl and CDs are included), so whether you use CDJs or turntables, you can simply plug them in alongside your laptop (connected via the USB port), and even hook up external drives via the dual-port USB hub. Alternatively, you can use it as an analogue mixer or swap between the two functions mid-set. The Z2 is built like a tank. Reassuringly heavy with a metal chassis, every knob, button and fader imparts a sense of firm, tough quality. And the crossfader, like those on all great scratch mixers, is extremely loose, with an adjustable curve that goes all the way to straight cut, where even the slightest touch is enough to engage the other channel. As you'd expect, the Z2 goes some way beyond just the DJ mixer basics. For starters, it features two Remix channel strips, affording access to Traktor's much-respected real-time Remix Decks (a total of four Remix channels). These are pretty much limited to playback only, though, so you'd need to attach a Traktor F1 controller (or two) for full control. The four Remix Deck buttons also double as cue points for the main decks, and looping controls are available (the LED above the faders shows the current loop length), as are some useful effect controls. The central panel, meanwhile, hosts track loading and browsing controls. Another great feature is the Allen and Heath-style filter dial on each deck (like the EQ, it's available in analogue mode, too), dialling in high-pass filtering when turned clockwise and a low-pass filter in the anticlockwise direction. "The Traktor Kontrol Z2 is an awesome bit of kit and a stunning entry into the DJ mixer market for NI"
The whole thing is clearly geared towards DJs who bring their own kit to the club: the crossfade curve control and headphone sockets (1/4" and 1/8") are both located on the front edge rather than the top panel, making the Z2 unsuitable for recessed installation. The Traktor Kontrol Z2 is an awesome bit of kit and a stunning entry into the DJ mixer market for NI. There are far too many clever little touches to list here, but one particular favourite is the ability to mix vinyl or CDs as audio while still using Traktor's effects. Also noteworthy is the auxiliary input, which lets you plug in a fail-safe so that if the unthinkable happened and Traktor crashed, you could just hit play on a connected playback device and save the day. Versatile and keenly priced, the Z2 is hugely powerful, appealing to DJs across all genres who have neither the need nor inclination to run four simultaneous decks with eight remix channels but who still want powerful Scratch control over two decks and to throw in loops. In that capacity, we think it currently stands alone.